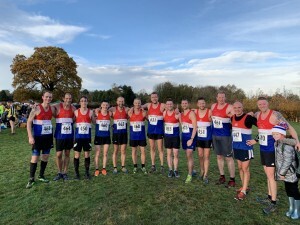 Thirteen Senior Men travelled the short hop down the M6 to Coundon Hall Park, Coventry, to represent the club in the first fixture in this years Birmingham League Cross Country Division 3 fixture. Senior Mens Team LtoR – Craig, Jerome, Jacob, Jordan,Tim, Andy, Richard, Bruce, Paul, Simon, Jon, Mark and Scott. In their first Birmingham League fixtures U/20’s Jordan Nixon and Jacob Droogmans lead the clubs charge, with Jordan finishing in 6th (32:56), Jacob was 10th (33:34), Simon Ford (33:36) and Tim Sharman (33:41) were next in with 12th and 13th respectively. Bruce Johnson was next in 38th (35:33) and Andrew Walker finished 46th (35:50). Paul Tatler ran 36:10 to finish 51st, Jerome Stevens was next in 65th (36:52), Richard Longley was 104th in 38:01, with an under the weather (but still competing) Team Manager Craig Taylor in 113th (38:27). Next in was Jon Ranford in 131st (39:26), Scott Zikmanis was 155th (40:27) and Mark Cotton was our final squad member in 157th (40:34). All 11 of our athletes were in and packed really strongly in a large field of 280 finishers. Individually Jordan was 2nd and Jacob 3rd U/20, and our A team finished 3rd scoring 125 points, our B team finished 4th with 619 points. Well done to all our Men who competed, a good start to the Birmingham League Season and hopefully even more of our U/20, Senior and Masters Men will compete over the remaining three free races so that we can achieve promotion and get the best position possible. Thank you also goes to Tonia Vernon who acted as our race official and saved the club from a 200 point penalty. Next fixture is Saturday 1st December at Plock Court, Gloucester – Everybody Welcome!